Pineapple is a lovely mass of individual berries which have coalesced into a larger fruit… Whether you call it a fruit or a berry, we know for a fact that it is usually love at first bite. Who can resist a handful of bacon-wrapped pineapple bites, or carrot and pineapple slaw? The first recipe is just “Wow!”, and the latter recipe uses up all of that leftover fresh pineapple, just in case you were wondering how to eat it, snacking reasons set aside. And this coconut amino, garlic and pineapple juice glaze really dances the hula in the spotlight. It is the sauce that holds these chicken, pepper and onion skewers together. Follow the directions closely, put a lot of love into what you are cooking and imagine that you are at a Hawaiian luau, diving into the feast at hand. The sun is setting over the water, coconut drinks are being served with a hint of rum and pineapple juice, the music, the flowers, drifting, drifting away – don’t forget to rotate the skewers every few minutes while you are dreaming! Keeping in mind that pork is one of the traditional offerings at a party, you may also want to toss a few Hawaiian-style pork chops on the grill, that is if you are throwing a party for yourself. If your goal is just a cozy dinner at home, why not tuck into a scrumptious bowl of cauliflower rice with those tender bites of chicken and sweet pineapple on the side? Add the garlic, ginger, coconut aminos, fresh pineapple juice, salt and pepper to a saucepan. Bring the sauce to a light boil and simmer 10 to 12 minutes. 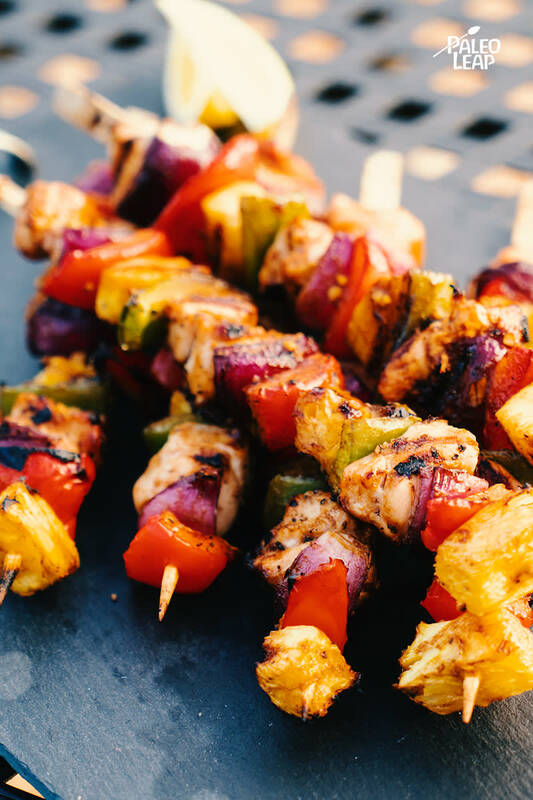 Thread the chicken, bell peppers, onion and pineapple chunks on wood skewers – alternating ingredients. Coat the skewers with the sauce, making sure they are well covered. Grill 12 to 15 minutes, turning every few minutes, or until chicken is cooked through and vegetables are tender.